The day my new Pampered Chef pizza stone arrived we had homemade pizza for supper. 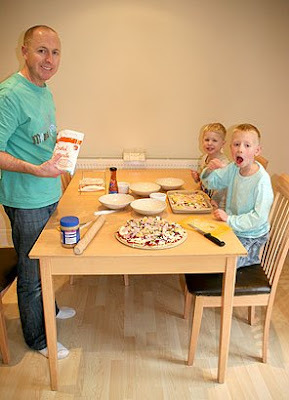 Grant had made the dough in the breadmaker while I was on my way home, I had previously made some pizza sauce and had stocked up on cheese and toppings. 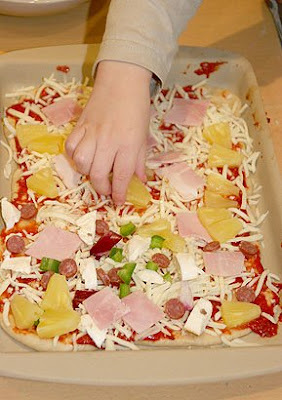 I'll post recipes when I perfect the art of homemade pizza - our first attempt was okay but I think we need to pre-bake the base a little. Loading heaps of fridge-temperature ingredients onto the raw dough caused the toppings to start to darken a little too much around the edges before the crust in the middle had cooked properly - fancy stoneware and all. But we all had fun anyway, and here are the pics to prove it. Here's Grant and my pizza (no, we didn't eat it all!) 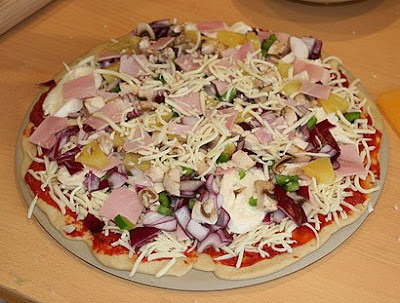 loaded up with pizza sauce, mozzarella, ham, salami, mushrooms, pineapple, red onion and green pepper. 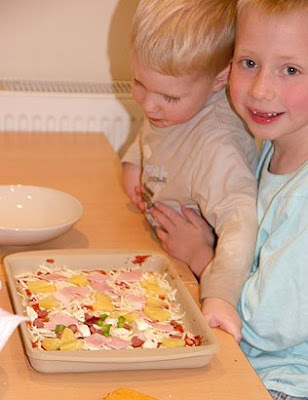 Daniel opted for ham, pineapple, salami and green pepper with chunks of mozzarella as well as the grated version. Noah was happy with just pineapple and ham with his cheese.